Triumphant rebel fighters and thousands of ordinary Libyans stormed Col. Moammar Gadhafi’s fortress compound here Tuesday after a daylong battle, but the elusive strongman was nowhere to be found. Antiregime troops waged fierce battles at the gates of Bab al-Aziziya, Col. Gadhafi’s longtime home and headquarters. 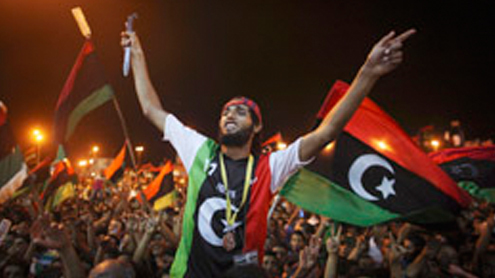 When rebels breached one of its gates in the late afternoon, Tripoli residents joined in to cheer and embrace. With celebratory gunfire giving way to a pandemonium of looting, rebels and residents made off with weapons, flat-screen television sets and souvenirs from the rule of their leader of four decades. One man waved an ivory staff capped with an engraved elephant head. Another made his way across the compound’s sweeping lawns, wheeling a gold-plated cocktail trolley. The capture of Col. Gadhafi’s complex, already heavily damaged by North Atlantic Treaty Organization airstrikes, stands as one of the rebels’ highest moments in their six-month battle to topple the world’s longest-tenured current ruler. By late Tuesday, Libyan opposition leader Mustafa Abdul Jalil told cable news networks that Tripoli had been liberated and that rebel leaders would begin traveling to the Libyan capital on Thursday. But even as Mr. Abdul Jalil spoke, there were reports of continuing battles here, underscoring the chaos that hangs over this city of two million people. Pro-Gadhafi fighters blockaded foreign journalists in their city-center hotel. West of Tripoli, about 40 miles from the Tunisian border, forces loyal to Col. Gadhafi continued to pound the Libyan port town of Zuara with mortars and rockets, a resident there said late Tuesday night. And in perhaps the deepest indication that the rebels’ mission of liberating Tripoli remains unfinished, the whereabouts of Col. Gadhafi himself were unknown. According to news reports, the embattled leader addressed Libyans late Tuesday on a Libyan radio station, local al-Orouba TV reported. He said his withdrawal from Bab al-Aziziya was a “tactical move” following dozens of NATO strikes there. He vowed martyrdom or victory in his fight against NATO aggression, according to the reports. Ibrahim Dabbashi, who represents rebel leadership as the deputy ambassador to the United Nations, told reporters in New York that he expected Col. Gadhafi, his family members and other high officials to be hiding in private homes or in the city’s underground tunnels, which he said had been built by the Libyan leader for security purposes in recent years. U.S. military officials said that while the situation remains fluid, they believe the rebels control most of Tripoli. In Dubai, U.S. and British diplomats huddled for another day with rebel representatives to put the finishing touches on a post-Gadhafi stability plan crafted by the Libyans with Western help. Officials said the U.S. and its allies are advising the rebels on how to quickly restore basic government services and protect critical infrastructure, including oil assets. State Department spokeswoman Victoria Nuland said the Obama administration was “working urgently” to release an initial $1 billion to $1.5 billion of Gadhafi-regime assets frozen by the U.S. since February. The frozen assets, totaling some $37 billion, are intended to be used to support Libyan government institutions and for reconstruction efforts, officials said. One of the officials said the U.S. hopes to release that first chunk of money later this week. The fall of Col. Gadhafi’s compound, which rebels had said contained the largest remaining concentration of his loyalist forces, represented a major step toward securing Tripoli. But rebels’ fortunes have whipsawed dramatically in recent days. Even as Col. Gadhafi’s tenure is functionally over, a core of loyal supporters has continued to battle in pockets throughout the city. Rebels said they expected trouble securing two of Tripoli’s most densely populated neighborhoods, the southern slums of Abu Saleem and Hadba, which have long been known as pro-Gadhafi strongholds. Also Tuesday, several international journalists remained pinned by pro-Gadhafi forces inside a hotel in Tripoli, where reporters have stayed throughout the conflict. The attack on the Bab al-Aziziya compound began early Tuesday, led by rebel fighting units from western Libya. Nearby streets rang with mortar, heavy machine-gun and cannon fire as rebels besieged the fortified gates to the compound that sprawls over an area the size of several square city blocks. Rebels said they used a bulldozer to breach the compound’s walls.